There are times when it seems as if life has you on a hit list and is coming after you with all it has bent on your destruction! Yet even though it may seem that way what life is actually doing is testing, strengthening, and deepening your relationship with God. Over the years I have come to see life as “God’s School for Living” where we are tutored and mentored in the “finer practice” of trusting Him with all aspects of our lives. The Easter story from the raising of Lazarus to Jesus’ arrest, trial, conviction, sentence of death, beating, trek to the cross, crucifixion, hours on the cross, death, and finally his resurrection is the Holy Spirit’s ultimate testimony of God’s Compassion, Love, Providence, Ultimate Authority, and Trustworthiness. In order to gain a deeper understanding of how the Easter Story impacts our lives we need to insert our life in each chapter not just as witnesses but as participants. For example when we find ourselves in the crucifixion chapter we need to be the one with the hammer, because it is for us Jesus is there. In the Resurrection chapter we need to be in the tomb and watch in awe as God pours life back into a dead Jesus and witness the doorway of death falling helplessly to the ground. 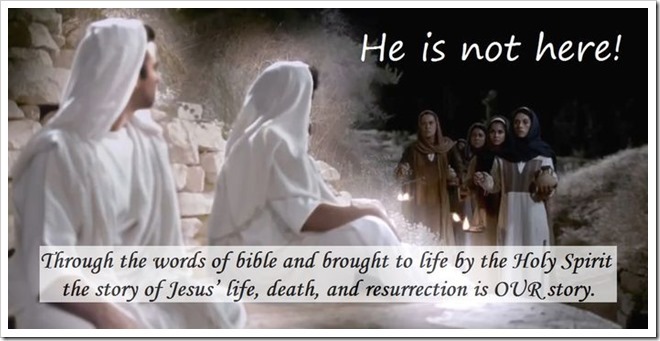 Through the words of bible and brought to life by the Holy Spirit the story of Jesus’ life, death, and resurrection is OUR story. It is my hope and prayer that you my muster up the courage to ask the Holy Spirit to give life to the Easter Story in you during the remainder of Lent.